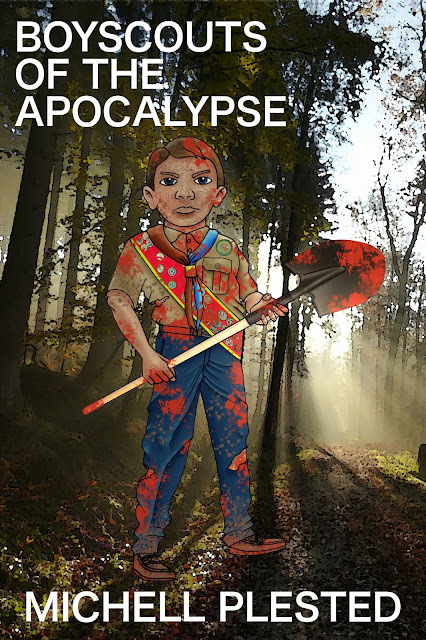 I had the privilege to produce the cover for Michell Plested's awesome novel "Boyscouts of the Apocalypse." This cover was really fun to work on. I did the sketch in pencil, inked it with a Sharpie Pen - Fine Point, and all the coloring and typography was done digitally in Gimp (like Photoshop but freeware). You'll be able to read it for free on Wattpad soon and I'll make sure to come back and add the link. For now you can listen to an audio version of it at www.actionpackpodcast.com.